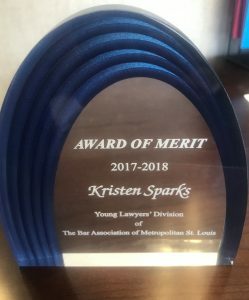 On May 2, 2018, at the Bar Association of Metropolitan St. Louis’s annual Law Day celebration, Kristen Sparks received an Award of Merit from the Young Lawyers Division. 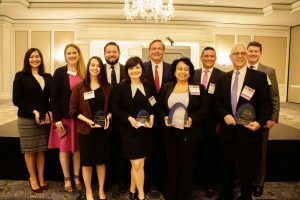 This award recognized Kristen’s contributions to the Young Lawyers Division during her 2017-2018 term on the executive board of the Young Lawyers Division. Kristen will continue to serve on the executive board for the 2018-2019 term.